Users can either choose from a set of interactive graphics or create their own to help them study. Image: Quizlet. Quizlet on Thursday unveiled a new feature to customize study materials. Diagrams allows students to annotate images, maps and other graphics with information, helping them to study efficiently and interactively. The learning platform is used by one in two high school students and one in three college students in the United States. “Quizlet already hosts over 200 million fully customizable study sets across every subject area, and Diagrams provides students and teachers with an added opportunity to study in a way that best caters to their needs and the specific content they’re learning,” according to a statement from the company. To build a new study set in Diagrams, students upload an image and enter any corresponding terms and definitions that may be useful to know. They can study their diagrams in Quizlet activities via laptop or smartphone at their own convenience. 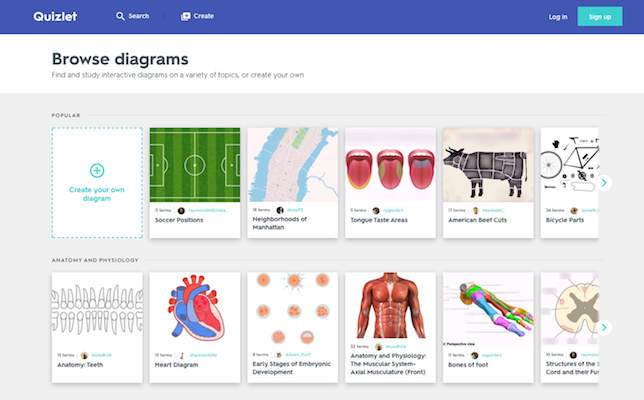 Teachers can create and organize diagrams too, and save and share them with students. The company offers free and paid subscription options for both students and teachers that enable further customization. More information can be found on the Quizlet site.